Can we imagine such a situation? When we look at newspapers, we can find many headlines which preaching a demise of the euro. Nonetheless, we should read these predictions with a great distance and do not believe in this kind of speculations. We should try to select information and rely more on economists’ words than journalists. I would like to refer to Robert Mundell’s statement regarding the situation in Eurozone. According to him, in the EU and EMU, the problem is not a common currency but budget deficits of the Member States and indebtedness of a few of them. To illustrate better his point of view, Canadian economist asks the question: If the federal government of Canada, state government of Newfoundland or Ontario increase their public debts, will it be a problem of a budget deficit or Canadian dollar? Moreover, Mundell continues his argumentation by comparison the Eurozone to the military alliance. The abandonment of the Eurozone by Greece which has more liabilities than assets, in fact, could make the EMU stronger. He states that EMU is kind of phenomenon because the monetary union which encompasses such a big part of global economy and develops in one and half decade, has never existed before. What is interesting in Mundell’s approach to the euro is a belief in strength of the common currency. For this reason he is called a “godfather of the euro”. His point of view is unusual for Northern American and British scholars who are sceptic towards the euro since its appearance. For them, the euro, which pretends to be a global currency, became a real threat for American dollar and British pound. In my opinion, instead of burying the euro and the EMU too fast, we should draw attention on its role that plays in global economy, and we have to aware that each monetary union matures for ages. The best example is monetary union in the U.S. which was established by Act of Constitution in 1789, and it took almost one hundred and fifty years there to gain an optimal currency area. It would be better if maturation of the EMU took less time. However, the subsequent reforms within the Eurozone such as common banking system and enhanced political cooperation are a must. The practice of some Member States that leads them to excessive indebtedness must be eradicated as soon as possible. It jeopardizes stability of Eurozone as a whole and brings about a drop in trust between partners. In this place we should refer to the past and take into account aforementioned American (or German) monetary union which are successful due to strong sense of community. In case of the Latin and Scandinavian Monetary Union situation was completely different. They failed because of a lack of political integration and consequences of the First World War. Finally, I would like to refer to Bohdan Wyznikiewcz’s words. He says “there will be many dramatic twists involved in a cure of the euro; nevertheless the euro’s survival is more feasible than its collapse”. 1. 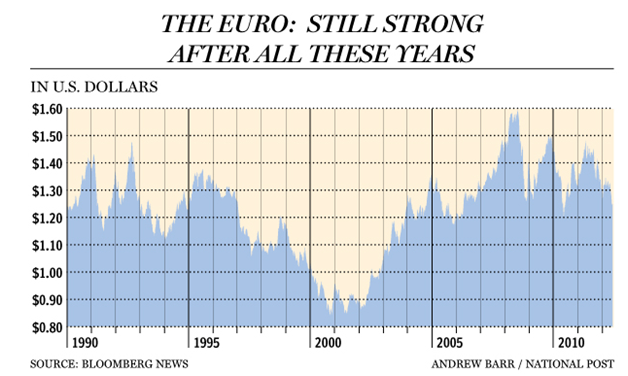 Robert Mundell, Euro is here to stay, Financial Post, Jun 8, 2012. http://opinion.financialpost.com/2012/06/08/robert-mundell-euro-is-here-to-stay/. 2. Hugh Rockoff, How long did it take the united states to become an optimal currency area?, NBER working paper series on historical factors in long run growth, NBER Historical Paper No. 124, http://www.nber.org/papers/h0124. 3. Bohdan Wyznikiewicz, Koniec strefy euro? To sie nie stanie, Obserwator Finansowy, 31 March 2012. Traktat Lizboński poza wieloma ważnymi zmianami przyznał Unii osobowość prawną. Dzięki temu Unia zyskała możliwość podpisywania umów międzynarodowych w dziedzinach swoich nadanych kompetencji i przystępowania do organizacji międzynarodowych.